On April 27, KFC will offer each customer a free piece of grilled chicken in a national rollout of the product. Will the new strategy sizzle or sink? LOUISVILLE, Ky. — Would KGC ever have the same ring? In a culinary gambit backed by buckets of big money, KFC is hoping to replicate its founder's recipe for success with the national introduction of Kentucky Grilled Chicken. This week's rollout is KFC's most ambitious attempt to win over health-conscious customers as the chain known worldwide for fried chicken tries to reinvigorate lackluster U.S. sales. "It's going to get people who haven't eaten KFC for a long time to come back into our restaurants," said KFC President Roger Eaton. "It's going to get people who have never eaten KFC to come into our restaurants." Eaton says he spent years as part of the team tinkering with a grilled alternative, and the rollout follows KFC's longest market test ever. It will be backed by a marketing blitz. Grilled chicken items are staples at some KFC competitors. McDonald's Corp. offers grilled chicken in sandwiches and wraps, and says chicken sales "continue to be extremely good." McDonald's has also recently been emphasizing its new Southern Style Crispy Chicken sandwich, which is fried. KFC's slow-grilled chicken drew strong reviews from the lunchtime crowd Monday at a KFC restaurant in Louisville, the chain's hometown. Eddie Collard proclaimed grilled better than fried. "I think the colonel would be happy," Collard said of KFC founder Colonel Harland Sanders. Like its predecessor, Kentucky Grilled Chicken has its own secret recipe. The original copy of the recipe — a blend of six herbs and spices — will be kept in an electronic safe at company headquarters. It will sit alongside Sanders' handwritten recipe of 11 herbs and spices coating the chain's Original Recipe fried chicken. The difference is in the nutritional numbers. KFC says each piece of its grilled chicken has 70 to 180 calories and four to nine grams of fat. By contrast, the Original Recipe items have between 110 and 370 calories and 7 to 21 grams of fat, depending on the piece. The grilled chicken contains from 160 to 440 milligrams of sodium per piece, as opposed to 290 to 1,050 milligrams of sodium per piece of Original Recipe chicken. Michael Jacobson, executive director of the Center for Science in the Public Interest, a Washington-based advocate for nutrition and health, called the grilled introduction a "major step in the right direction." While applauding the reduction in sodium, Jacobson said the 440 milligrams listed by KFC in a grilled chicken breast still amounts to more than one-fourth the amount that someone middle aged or older should consume daily. KFC has launched non-fried chicken before, but each prior initiative flopped. In the early 1990s, it introduced a rotisserie-style chicken that fell by the wayside due to equipment problems and long cooking times. A tender roast product followed but lasted only a couple of years. Eaton said the difference this time is partly in the cooking process. Chicken is cooked in custom-designed ovens in a patented process that takes about 20 minutes per batch. KFC won't say how much the ovens cost, but Eaton said the company helped franchisees with the expense and would have made such an investment only if it was "incredibly confident about the outcome." Larry Miller, a restaurant analyst with RBC Capital Markets, said expanding beyond its fried staple offers a huge opportunity for KFC. But perceptions won't be easy to change. "They still have the credibility barrier to overcome," Miller said. While achievable, "it's tough when your name has 'fried' in the middle." 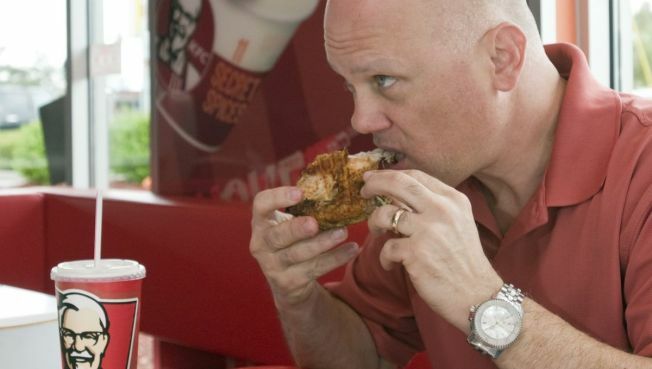 Mike Ash, who ate a grilled chicken lunch at the Louisville KFC, remembered the rotisserie chicken as "mushy and bland." He liked the new grilled offering, having picked it to the bone. He said he might be more apt to pick up a bucket of chicken on his way home, though he predicted he might still "fall off the wagon every now and then" and choose the fried option. The grilled chicken will cost the same as Original Recipe chicken. KFC will offer customers a free piece of grilled chicken on April 27. But the push for grilled chicken doesn't mean KFC is abandoning its roots, Eaton said. The chain is testing new fried chicken products, and remains committed to its core product. "It would be incredibly arrogant to think we could create a product that could supersede Original Recipe chicken," Eaton said. "But this product is easily good enough to sit alongside it."